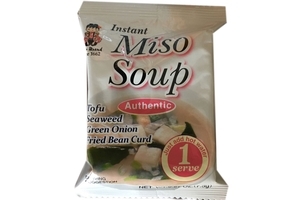 Miko Brand Instant Miso Soup Original Flavor in 0.27oz (7.5g) bag. Enjoy healthy Miso soup in 5 seconds. All the stuff is inside of this magic cube. All you need is just hot water and a cup!1 serving contains - Tofu, Seaweed, Green Onion, Fried Bean Curd. Made from non-GMO Soybeans. Product of China. Dried Fermented Soybean, Paste(Soybeans, Rice, Salt).Dried Green Onion, Dried Tofu (Soybeans, Calcium Sulfate,Corn Starch, Trehalose),Fried Bean Curd(Soybeans, Vegetable Oil, Magnesium Chloride, Vitamin E), Bonito Extract, Dried Seaweed, Monosodium Glutamate, Salt, Corn Starch, Bonito Powder, Disodium Inosinate, Disodium Guanylate, Vitamin E.